Well this explains why my flight was canceled. Update 3: I'M ON A PLANE!! I’ve been rebooked from my flight to Dallas to now flying into Nw Arkansas. 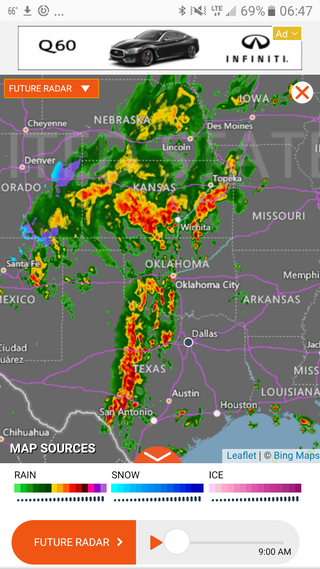 Although looking at the map, I don’t quite understand how the weather is any better so we shall see if I make it there and/or get stuck in Arkansas forever. I checked a bag today as well so I’m wondering what the odds are of my bag being lost forever as well. Fun day of work travel! As of 1700 Central time I’m still in Fayetteville, AR after arriving here around 1300. My next flights were canceled twice and now I’m scheduled for the 2000, the last flight of the night. Really hoping I don’t get stuck here overnight... At least lunch was good, had a nice medium rare burger with Swiss, bacon, and all of the fixings. Decently proper meal for airport food. Guess I might be having dinner there as well, maybe I’ll try the pulled pork sandwich with burnt end beans as a side this time or the brisket cheesesteak. As of 2100 I am STILL in Arkansas. Apparently this time there was a maintenance delay on the incoming plane from Dallas and then there were no pilots for the plane once it was finally ready. What a marathon of a day! It is planning to finally take off soon but I don’t have my hopes up. Since its a maintenance delay the airline would have to pay for a hotel for the night. But I’m still holding out hopes we make it out of here. I’ll be getting to my hotel after midnight tonight but at least I’d make it there. Still hoping! Anybody have some sick gifs? Its now 2330 and I'm finally finally on a damn plane!! By the time I get to my hotel I'll have been awake for about 22 hours but man I'll finally have made it. Gotta grab some McDonald's since it's 24 hour and right next to the hotel so I can walk. All I care is that I'm finally almost done with this day.